If you’re partial to the gently weathered, driftwood-like, silvery gray color untreated teak turns, read no further. But if you’re going to oil, seal, or varnish teak to restore and maintain that golden beauty you originally fell in love with, it needs a thorough cleaning first with a teak cleaner that’s safe for use on teak. The same thing goes if you’re tired of looking at tired-looking teak on your boat’s deck or trim. Especially haggard-looking, dark gray or black, pollution-ravaged, fuel-stained, suntan oil-soaked, fish-blood-and-guts-covered teak that’s seen brighter days—literally. Or moldy, mildewed teak that leaves black spots on bathing suits and towels. It can eventually ruin the teak, if left untreated. Keeping teak wood clean prevents mold and mildew, enhances its beauty, and helps it last longer. 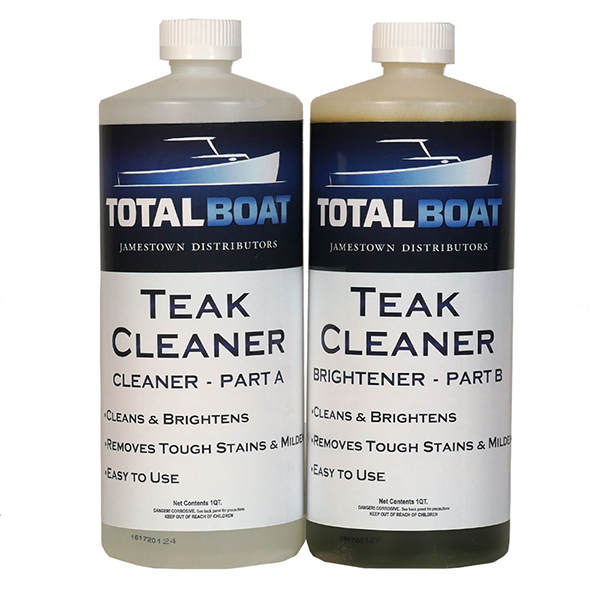 TotalBoat Teak Cleaner restores it to its former, golden-hued glory. After applying part A to wet teak, scrub lightly across the grain to remove dirt. Going against the grain is important because Part A actually opens up the grain, and if you scrub in the direction of the grain you’ll be pushing the dirt in deeper instead of removing it. After rinsing away Part A with fresh water, apply Part B and scrub lightly across the grain again. Use fresh water to wash off Part B and you’ll be looking at cleaner, brighter teak—it’s that easy. Before varnishing or sealing, let the teak dry completely for at least 24-48 hours. Cleaning the teak may raise the grain slightly, but a light sanding with take it back down. Application methods: Sponge, brush, or rag. For control and consistency, work in small areas, a few square feet at a time. Warnings! Each component must be used separately—DO NOT combine Parts A and B. Part A must be used first to open up and clean the grain; Part B neutralizes Part A and brightens teak. If Part A gets on gelcoat or fiberglass, neutralize with Part B. Do not leave Part A on any seams or caulking for longer than 5 minutes without neutralizing it with Part B.
Harsh cleaners can dissolve and destroy expensive teak. TotalBoat Teak Cleaner will not harm teak, but it may hurt other surfaces. Before starting, mask fiberglass, gelcoat, or aluminum surfaces that are near the area to be cleaned. Also, mask or remove any aluminum or painted parts attached to the teak. And be sure to protect yourself—especially hands and eyes—by wearing adequate personal protection.